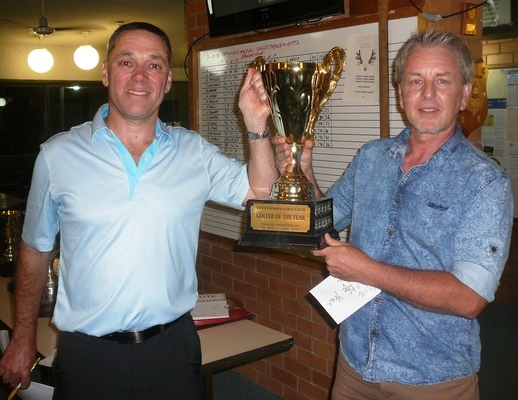 Stanthorpe Golfer of the Year Scott Constable accepts his Trophy from Club President Stephen Kay. Following Monthly Medal round Stanthorpe golfers, members and their families partied well into the night celebrating annual Xmas party and the announcement of the 2018 male and female Golfers of the Year. The honours this year went to Nikki Waterworth and Scott Constable. President Stephen Kay congratulated all 2018 trophy winners. He also thanked golfers and their families for their support this year and also during the club’s six year journey out of debt after struggling for many years. He also paid tribute to the Club’s sponsors for they unwavering support and announced the future is looking bright for the club which is back the black thanks to lots of hard work from all of the club’s many volunteers. He announced that the club is now in the black for the first time in twenty years. He paid tribute to all of the volunteers for getting it to that position this year.